For more books, search also under Tsimshian Language. For more resources, search the catalogue under the subject heading Nisga'a--Language and Niska Language. Gitxsanimax for kids/ Vickie Jenson and J.V. Powell (1980) Multi-volume children's book set. Online Gitksan Dictionary Online (in Beta) (2018) Also available as an app on Google Play and in the Apple App Store. For more resources, search the catalogue under the subject heading Gitxsan Language and Gitksan Indians--Language. 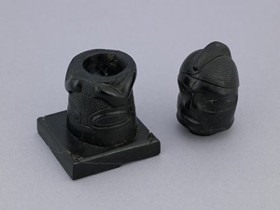 Haida Gwaii Ink Pot by Derek Tan.